One year after Austrian biodiesel engineering firm BDI completed upgrades at Crimson Renewable Energy in Bakersfield, California, including process optimization and expansion, the company announced another milestone project at the same facility. Valero and Darling Ingredients announced they will initiate an engineering and construction cost review to analyze an additional project that would grow production at their Diamond Green Diesel renewable diesel facility in Louisiana to 550 MMgy. Hawaiian Electric Co. and Pacific Biodiesel Technologies signed a three-year biodiesel supply contract for the new 50-MW Schofield Generating Station, 8-MW Honolulu International Airport Emergency Power Facility, and other Oahu generation facilities. They've been following National Biodiesel Board workers and members around for almost two years. 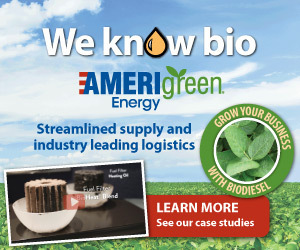 Now, finally, the story of biodiesel will be shared with a large, national audience as Discovery's Hot Grease makes its on-air debut Thursday, Nov. 16. The EU Parliament Transport Committee decision to reject MEP Bas Eickhout's opinion, and not to endorse the hardline Environment Committee position on biofuels, is yet another sign of the divisions over where EU biofuel policy should be heading. The commerce department issued its final determination in the case of subsidized biodiesel imports from Argentina and Indonesia. Importers must pay cash deposits of more than 70 percent for Argentine and 34 to 65 percent for Indonesian biodiesel. Lake Erie Biofuels, dba Hero BX, celebrated one year of business at its blending and distribution terminal in North Hampton, New Hampshire, in grand style by hosting an open house and appreciation event Nov. 2 for customers and the community. Revenues in Q3 were $627 million on 151.5 million gallons of fuel sold. Q3 revenues were essentially flat with the prior year period despite the lapse of the biodiesel tax credit. Net loss attributable to common stockholders was $11.4 million. Biodico introduced its Master Community Design technology at the Zero Net Energy Farm Summit hosted at Red Rock Ranch in Five Points, California. The tech connects farms and surrounding communities with clean, affordable energy and local jobs. The Illinois Soybean Association checkoff program is partnering with Tow Trucks for Tots to help bring toys to needy children, while educating tow truck drivers on the benefits of B20 biodiesel fuel. The annual event will take place Nov. 12. Germany's Office for Agriculture and Food (BLE) has published an evaluation and progress report for 2016 in which it shows that, for the first time, consumption of biodiesel from used cooking oil (UCO) exceeded that of rapeseed biodiesel (RME). The lustrous cells on the surface of the clam scatter bright sunlight, efficiently converting it into fuel. Using what they learn from these giant clams, the University of Pennsylvania researchers hope to improve future production of biofuel. The White House Office of Management and Budget is reviewing the U.S. EPA's final rule to set 2018 Renewable Fuel Standard volume obligations, along with the 2019 volume for biomass-based diesel. The move marks a final step before public issuance. ExxonMobil and REG announced Nov. 1 that by utilizing REG's patented fermentation technology, the companies' joint research program has demonstrated the ability to convert sugars from a variety of nonedible biomass sources into biodiesel. The 2017 Renewable Industries Forum took place in Ottawa in October. The 14th annual event brought more than 100 experts from government, industry and academia together to address Canada's priorities in climate change mitigation and adaptation.